We’re reliable, knowledgeable, and trustworthy. And, of course, we LOVE dogs. We believe in the strength and importance of the dog-human bond and know that dogs take something away from every interaction they have. So our goal is to always make our hikes, walks, and dog boarding time with your pup positive and productive. There’s a big litter of dog walkers in Oakland, CA, to choose from—but here are the many reasons why we lead the pack. Our amazing caretakers are dedicated to engaging and bonding with your dog every day. We always have backup, so your dog never misses an outing. 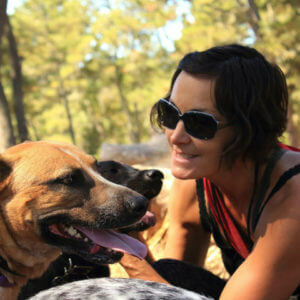 Our fun-and-fearless leader Audree proudly knows every dog and gladly serves as your sole point of contact. 5% of our profits go straight to enhancing the lives of underprivileged youth, shelter dogs, and elders. We’re licensed and insured. We are certified by Dog Tec and Pet First Aid. We are also members of The Association of Professional Dog Trainers. We’re reliable, knowledgeable, and trustworthy dog walking professionals — learn about what makes us stellar here. As the owner of Jet Dog, Audree not only walks dogs, she runs the business. She serves as the sole point of contact for all clients to keep the standard of care high and consistent. Prior to starting Jet Dog, Audree was a personal/business coach, instructor/trainer, and HR manager—all experiences that have primed her to be someone you can wholeheartedly trust to care for your dog. Audree truly lights up when she sees a dog, which is why she’s out on the trails daily frolicking and playing with the pups. She’s had a special connection with dogs her whole life, thanks to her childhood furry friend, MacGregor. Today, her dog Jet serves as the namesake for the business and continues to prove that dogs make Audree a happier human. Patrick is an East-Coast transplant with the perfect amount of East Bay in him. For many years, he was a dog walking professional in San Francisco, so he knows dogs and pack behavior very well. (He’s also an overall great guy!) Pups just love the way he talks to them. Hargo has spent the better part of the last decade in the pet industry, which means he has tons of doggie knowledge and is always ready for a fun-and-fur-filled day on the trail with a pack. When he’s off the trail, he spends his time with his own pup, Junior. 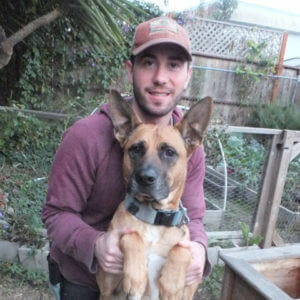 Gus is a bay area native who grew up with animals and loves spending time with them, instead of eating them. After a year working with wild dolphins, Gus picked up the skills needed to lead a pack. Very enthusiastic, Gus will wear down any energetic dog with games and old-fashioned running. 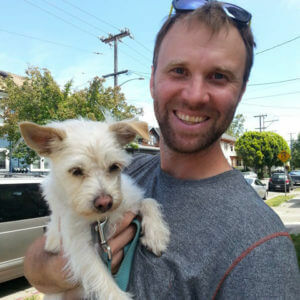 When he’s not diving in the bay cleaning boats or feeding sharks at the aquarium, you can find him romping around the Oakland hills with his one-eyed Min Pin, Leela. When Liz isn’t taking care of her own fur baby or teaching yoga at Funky Door in Berkeley, she’s taking Jet Dog pups on leashed neighborhood walks. She has spent many volunteer hours at shelters taking care of a variety of dogs with different behavioral issues. Delaine has been joyfully and responsibly walking and caring for dogs since 2010. She graciously opens her dog-friendly home to Jet Dog pups regularly. Her home features a securely fenced yard, lots of cozy spaces, and a treat jar full of primo dog treats, including homemade dog cookies. She also has a basement-level, dog-friendly art studio, to which she heads every day after her pack hikes are complete. Delaine shares her home with her dog-loving husband, and their two amazing pups, Monty and Betty.